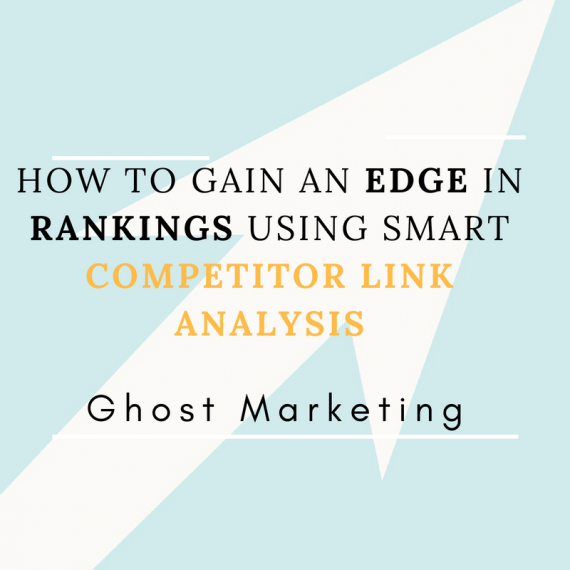 Competition analysis is one of the most effective ways of acquiring high quality links for your website. Over time, websites naturally pick up high quality backlinks even without any active backlink management. This is mainly due to PR, age of the business, steady growth and a number of other reasons. But even the average competitor in your industry who potentially has never heard of “Link building” – Could actually have hundreds of great links. This link prospects could/should also be linking to your site. 1 So What Do We Do? Surely when competitors have good link profiles this is a bad thing? Links are the #1 ranking factor in Google, so more links for them equates to higher rankings and more sales for their business. But, the key here is we can reverse engineer their link building strategies (or simply their live links) and pick up multiple great backlinks simply from improving on what they’ve already done. In this post I’ll be outlining 3 stages using Ahrefs that we love to use in-house to generate links at a very fast pace for clients in almost any industry. These techniques can work across almost any vertical and niche and are explained in extreme detail below. If you have any questions about these or would like to come on-board for a link building service campaign, please get in touch. This is the most basic level of competition analysis, and in some cases all that’s needed. There’s more advanced methodologies but for this post I’m going to keep things simple as simple is sometimes all it takes. This simply involves searching a keyword that you are looking to rank for. This is usually a larger, more competitive term that potentially is what you are offering. For this example I’m going to use “gym management software” as an example. We can see this is an extremely high cost per click keyword with some great search volume too. Next I like to look through the top few ranking results (but ignoring the “top” or “best of” style lists). In this case we’ve got three examples that look good: gymmastersoftware.com, zenplanner.com/solutions/gym-owner/ and mindbodyonline.com/fitness. Here are 3 separate software companies that provide a very similar service, I’m sure there are USP’s to each but as we’re not in the industry they look pretty similar. The next stage is to simply enter these site’s (one by one) into Ahref’s site explorer. This takes us from 318 links down to 89 relevant, dofollow, English links. That’s about a good number for this example, so we’ll continue with these. Remember you can do this for multiple sites on page 1 of Google for multiple keywords. This means you can have tens of thousands of different link prospects all within about an hour. I’ll break down each point above as they are essential to understand. Occasionally sites will link to other sites when it’s not all that relevant. For example if we linked to site’s mentioned above it wouldn’t exactly be the most relevant link (a link building/ marketing blog linking to gym management, that’s a stretch). There are occasions where relevancy does match, such as creating a bridge or if the site we’re prospecting is so powerful and authoritative, then relevancy takes a back seat. But generally speaking you want to have relevancy as the number 1 metric. Authority links drive rankings. The more trusted or authoritative a website is, the higher our organic rankings will increase when we generate a link from this source. It’s simple authority maths. If a link is difficult to achieve (on a high trusted website). Google relates this back to their algorithm to determine these sites wouldn’t link to low quality sources. Think BBC or NASA – They aren’t going to link to low quality spammy sites. As a result these sites act as a determinant of power and authority. Is it possible to generate a link? In some cases site’s linking to your competitors are going to impossible to generate links. This might happen if your competitor has a relationship with the site owner already, potentially owns the web property themselves or even if it’s simply a highly trusted source that has no editorial access elements. In this case it wouldn’t be worth getting in touch with this company for obvious reasons. Looking through the other top links we can see some very powerful links that talk about how they connect to different payment processors – Although these would be a long shot, it’s always worth getting in touch with these companies and connecting your software with these. Although this tends to only work if you have a well-known software. But if you do, the link is very easy to win. But the “16 fitness marketing tips in 2016.” – We could easily approach this site and ask if they wanted an updated version for 2018. – Link one achieved. “Boost fitness marketing” – “4 easy to use online payment processors”– Here it would be very easy to approach this article and offer to increase it to the top 9 solutions on the marketplace and increase the size and quality of the article. Then simply sell them on this link AKA explain how by having a larger, more in-depth post will help their top-line. – Link 2 achieved. “PT Distinction” – “9 best booking softwares for personal trainers” – Again a very similar strategy to the above. In this case we might want to simply pitch some other incentive in return for a link placement or adding our product to the list. In this case money talks (but we don’t want to officially buy the link). So in other words we’d provide some other value and win the link. – Link 3 achieved. “Top 15 Gymmaster alternatives” – Again a very similar technique with these “best of” style lists. The easiest way to win the link in this scenario is to have an affiliate program, or offer commission for every customer they send to your software. If you really want to scale your white hat link building efforts then offer high recurring commissions here. – -Link 4 achieved. Siftery.com “Product Comparison” – 2 methods here; 1.) Ask if they could review your product against Gymmaster if you feel you have the superior solution. Then simply pay for them to write the post as otherwise this would be biased (obviously if your company wrote it.) 2.) Offer free use of the software for a month or even a year in return for a detailed review on the site. – Link 5 achieved. Within 10 minutes we’ve built out 5 angles to used that if outreached correctly would almost certainly achieve 5 live, relevant, powerful links. The final stage is how you actually reach out to these link prospects. We’ve established an angle to achieving these links depending on the prospect and what the linking site is doing. This is the part that takes time and you’ll become better with the more you do it. Make everything you email another person about them. People love to talk about themselves/their own websites. If you talk about how you like their site and potentially get them talking about something on their site BEFORE asking for the link, this increases conversions exponentially. A obvious one but something a lot of people forget especially in outreach. Similar to the above point, people want to feel special. If it seems you’ve sent this email pitch to 100+ people with no personalisation you will get a terrible reply rate, probably zero. But if you personalise each email and just spend 60 seconds on each one, the ROI for this time investment is incredibly high. Adding as many trust signals as possible, such as having your job title and an image of you personally in your signature will help your response rates. People can ignore a blank email, but when they see there’s a real person behind it, it becomes more difficult to ignore. Another tip would be to have a @companydomain.com email rather than a gmail account. This is due to multiple link building companies using brand new gmail or Hotmail email addresses. When you add customised, personalised follow up, you build rapport with the prospect by acting showing them you didn’t just mass email them! This is where the majority of our links come from. People are busy and 90% of prospects won’t respond after the first email. Especially if the pitch is “give me a link.” – Throughout the follow up and link pitching process remember to SELL your prospect the benefits of doing “business” with you. When you get a link from them, you not only help yourself but you can help the linking site too by sharing their post on social accounts, emailing your list or simply adding “featured in” elements to the site. The final tip is to pivot during your outreach. Find what elements are working well or badly and double down on the ones working well, tweak things that need to be edited and building out campaigns based on what’s working in your specific industry. In some industries, very formal, professional emails work best. In others you’ll want to be more casual in your emails and even getting someone on Twitter DM or Instagram will actually work best. Also finally, remember never be afraid to pick up the phone. No one. I repeat, no one! Will ever get a call from another person asking about their site (In relation to a link). So this strategy makes you memorable! Thanks for reading, if you have any questions about our other competitor link analysis strategies feel free to get in touch.